Just going through some old photos this morning and found this gem and HAD to write a quick blog post. This is 2008, our daughter Isa was 9 and her brother, Mario was 7. 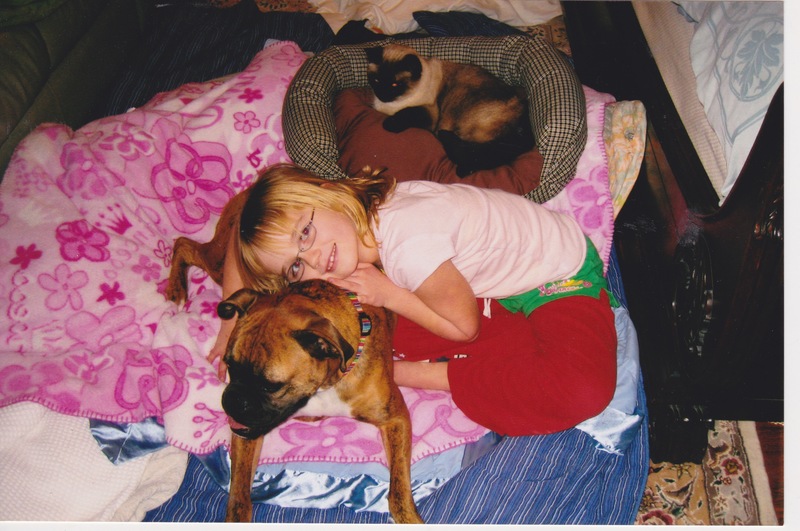 Those were our pets, Tango the boxer and Boris the cat. We lived in a beautiful 5,000-sq ft home on 34 acres. At bedtime we might as well have had a studio apartment! For at least 2 years, this is what the “family bed” looked like. Mike (my husband) would sigh when the lights went out and quietly say, “There are ALOT of beating hearts in this room.” I loved it! As Dad got “grumblier” about the situation, Isa would type “contracts” for him to sign designating a specific future date when the “family bed” situation would cease – but she always “filed” for an extension! Fast forward to 2015: both children are normal (okay, that’s debatable!) and sleeping in their own beds. But they have memories of many nights in our “shared sleeping quarters” watching movies, talking, laughing, playing with the pets. Some people think this is nuts and I do sort of get their point. But I am SO GLAD we did it. It gave the children comfort when they needed it and we have lots of fun memories to look back on….especially after they flee the nest, which I am dreading, of course. So, my advice to parents of young children struggling with the bedtime routine: give up! Enjoy being together now. I know there are all sorts of studies now encouraging “the family bed” but I don’t know where they are or what they are saying about the benefits. I know my 1950’s-era parents thought I was the WORST POSSIBLE type of wishy-washy parent while this was going on. The 7 of us were sent marching up the stairs at bedtime with 1 “regulation size” cup of water and ordered to SHUT UP AND GO TO SLEEP! Anyone who dared get out of bed and tiptoe downstairs again had better be ready for the WRATH of my DAD!!! At one point, tired of the “charade” of pretending to resist my children’s nightly pleas to sleep on my floor, I just gave in and bought 2 air mattresses at Wal-Mart for the Master Bedroom floor. In my opinion, this was one of the best investments I ever made. I could not agree more! While I never let ours share our bedroom I was more than happy to crawl into theirs if they needed me…and that included the top bunk! They are with us for such a short time, I didn’t want to waste a minute worrying about silly things like potty training, the “right” preschool or forcing them to sleep where they were uncomfortable. I just wanted to love them. Mine are pretty dang normal too. Potty training was a disaster at my house – that could be a television miniseries!! Delightful, as always, to hear from you.